Reverberate is an efficient convolution audio processor with modulation capabilities offering true zero-latency operation for two separate, stereo impulse responses. Reverberate seeks to provide a richer and more dynamic sounding reverb from impulse responses by optionally modulating an amalgamation of two, separately controllable IRs using an LFO. Further modulation is possible using the post-processing effects; an all-pass interpolator chorus provides a fuller sound and an over-sampled analogue prototype paragraphic equaliser is provided with dual LFOs. These features make for a livelier sound than typically associated with some convolution reverbs, according to LiquidSonics. IR mix modulation capability using an LFO. 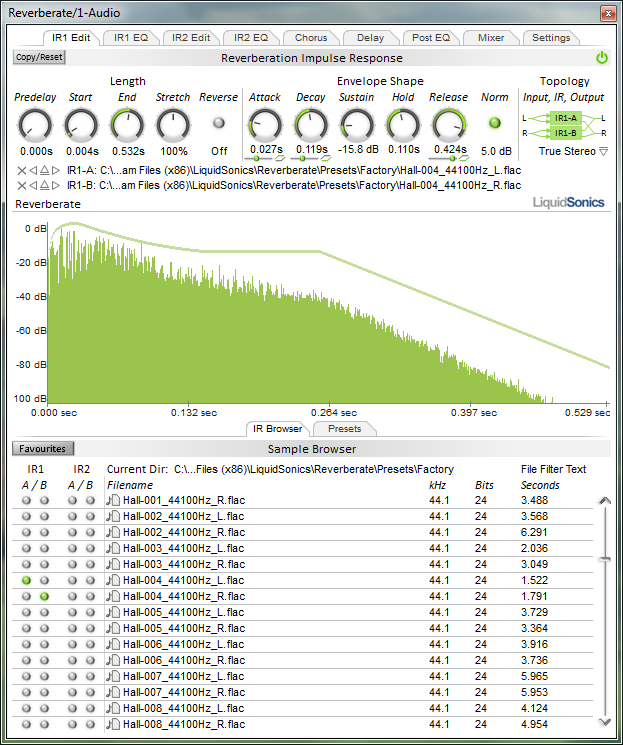 Wav, Aiff and Flac IR file support. Improved CPU efficiency for the standard and true stereo convolvers. Modest reduction in CPU consumption for the Fusion-IR convolver. Support for Fusion-IR installers and modified menus for quick access to installed Fusion-IR banks. Bugfix for an issue with true stereo file normalization. Bugfix for an issue where the initial presets could load as empty presets. Support for AudioSuite in the 64-bit AAX (ProTools 11 only). Added the ability to create expiring licenses for extended demoing. Optimized additional CPUs and instruction sets. New SplitMod feature to provide modulating delay spin-wander type effects to the early and late components of an IR. User definable favourite banks feature added. Bugfix for 192kHz operationwhen loading empty presets. Bug-fix for IR2 early reflections module. File browser back button now permanently visible. New IR1 EQ and IR2 EQ sheen control for adding synthetic high frequency content and presence. Bugfix for IR2 views not obeying multiple visualisation setting. The IR1 and IR2 settings can now be swapped, this is useful when IRs are chained. The IR browser now defaults to the previous location when the editor is closed and re-opened within a session. Updated sound file library to incorporate bug fixes. Added the capability to apply the master modulation of IR1/2 pan and mix pre or post convolution (previously only post convolution was possible). All: Additional tail generator tints added (cathedral, stone church, bright chapel and deep chapel). All: Added 8 new tail generator presets using the new tints. All: The copy and paste facility for presets now works after the editor is closed and re-opened. All: Added a new IR type to generate synthetic IR tails. All: Added 16 new presets utilising the tails generator. All: Memory is freed when IRs are inactive considerably reducing memory consumption in a single IR scenario. All: Added an option to modulate the IRxEQs using a decaying exponential. All: Changed the IRxEQs modulation view to be linear to more clearly visualise the decaying exp and linear behaviour. All: Smoother audio during program changes. All: More descriptive errors on registry or preferences file loading failures. All: Fixed a bug in the delay unit that caused a feint distortion effect when different delays were set per channel. All: Modification to enable full recall from chunk (assists full recall in Usine host). All: More accurate reporting of the IR tail length to the host (assists Wavelab mixdowns). All: Corrected focus bug in filters. PC x64: Installer provides an option to use the same plug-in ID as the 32-bit version. New in 1.660: Added the capability to assign up to 2 MIDI controllers to some common Reverberate parameters for enhanced modulation capabilities in MIDI performance scenarios. MIDI data must be routed to Reverberate via the host application (not all hosts are able to do this). New in 1.614: Control+click on post IR gain controls now resets the slider positions as well as the parameter value.